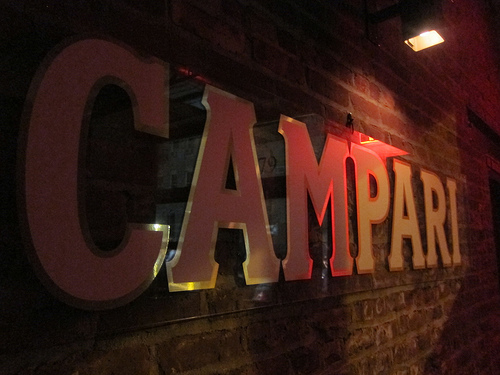 As part of this year’s Manhattan Cocktail Classic, I attended Campari‘s Count Negroni’s Birthday Bash where I enjoyed Negronis in all forms- freshly stirred, barrel-aged, bottled & carbonated and on-tap. 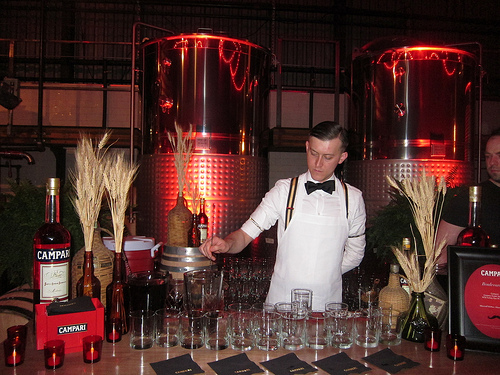 I had a sneak peak of the bottled Negronis at the Gala a few nights before. 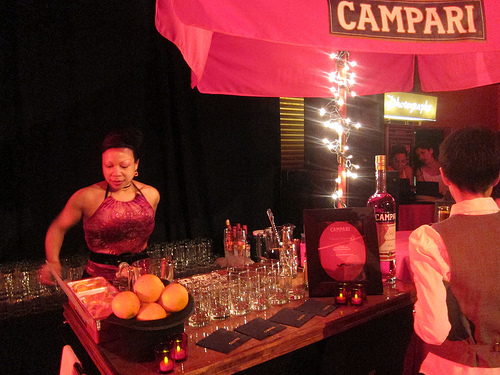 Before the party got started at the New York Distillery and adjoining bar, The Shanty in Brooklyn, Campari held the Best Aperitivo finals. 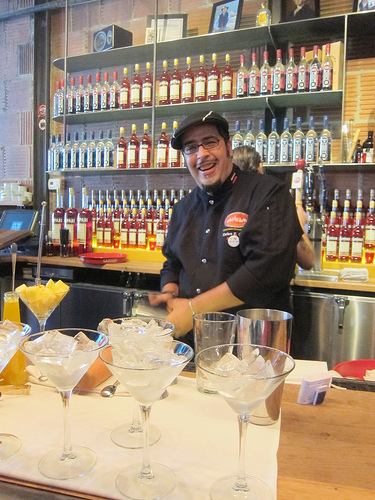 Previously Campari held regional contests and Carlos Cuerta representing the Ohio USBG chapter and Juan Alvarez, Jr. from the Los Angeles/ Orange County USBG chapter were among the 29 finalists. Contestants showcased their best cocktail and in the end, judges selected Morgan Schick from San Francisco as the winner. He goes on to compete in Beijing to represent the US in the International Bartender’s Association 2012 World Cocktail Championship Finals. 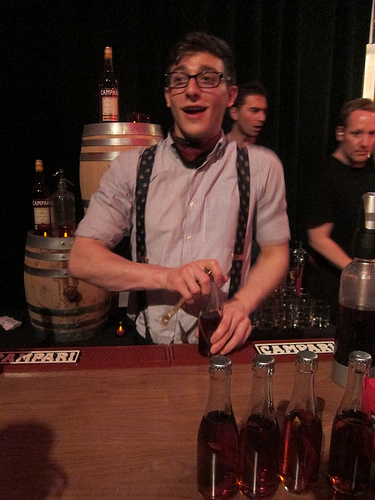 We kicked off the party with Negroni Sbagliato (Campari, Cinzano Sweet Vermouth, Mionetto) from Frank Cisneros (Dram). 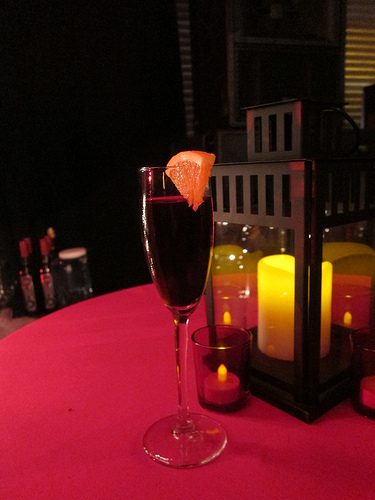 Everyone was dressed in their best mustaches and top hats for the event in honor of Count Negroni. And if you didn’t have the appropriate facial hair, temporary tattoos were passed out. Everyone had fun at the photo booth with the various props. And the music rocked with DJ Questlove rocking it out. Franky Marshall (Monkey Bar) and Kenta Goto (Pegu Club) were set up to stir Negronis made with the New York Distillery’s Dorothy Parker gin, Cinzano Sweet Vermouth and of course, Campari. There was something so “New York” about Theo Lieberman of Milk and Honey. I could imagine him as a street vendor selling carbonated negronis. Maybe one day ice cold bottled negronis could be had from food trucks in New York (and LA!). The crowd was also enthusiastic about welcoming Negroni’s cousin, Boulevardier (Campari, Wild Turkey 81, Cinzano Sweet Vermouth). Stirred by Maxwell Britten (Maison Premiere), he also cut quite the dashing figure. I had a great time meeting bartenders and enthusiasts from around the country while noshing on eats from local food truck. My favorite were the dumplings from Rickshaw Dumplings. I wish I wasn’t so full. I would have liked to have tried the food from Morris Grilled Cheese and Korilla. And it wouldn’t be a party without cake! Jane’s Sweet Buns served lemon gin cake with Campari strawberry frosting. It was also a treat to see Francesco Lafranconi receive the lifetime achievement award from the USBG. I half fell in love with him when I watched him MC the Mix it Up competition at Nightclub & Bar in March. He has such a head for stats and dates. I’m convinced he knows all the 100+ secret ingredients of Chartreuse or at least can find out. Well deserved, Francesco! And happy birthday, Count Negroni! More photos from the party here and here. This entry was posted in alcohol tasting, bar stories, bars, bartenders, cocktail competition, cocktail week, cocktails, contest, events, history, hot bartenders, spirits, the minty, travel and tagged barrel-aged, boulevardier, brooklyn, cake, campari, carlos cuerta, competition, count negroni's birthday bash, dj questlove, dorothy parker gin, food, food trucks, francesco lafranconi, frank cisneros, franky marshall, juan alvarez jr, manhattan cocktail classic, maxwell britten, mcc, morgan schick, negroni sbagliato, new york, new york distillery, ny, ny distillery, on tap, party, the shanty, theo lieberman, travel, williamsburg. Bookmark the permalink.